Can’t get to one of our bins? We can get to you! 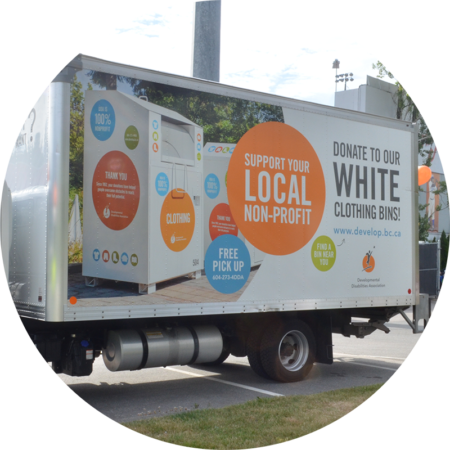 One of our white trucks will come to your home or business to pick up your donated items for free. For a complete list of items we receive, please visit our What Can You Donate? page. For a complete list of items we receive, please visit our What Can You Donate? page. To learn more about recycling with DDA, view our recycling brochure. Request A FREE Pick-Up Today! Alternatively, you can contact us at 604-273-4DDA or email us at clothing4DDA@develop.bc.ca. You’ve likely seen our white DDA trucks on the road, but do you know the drivers inside of them? Learn more about a couple of our friendly drivers and their favourite part of the job!